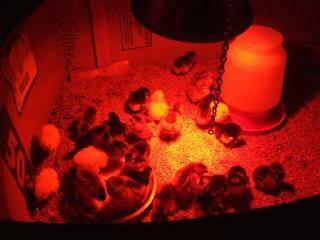 The baby chicks arrived today. I had a dream they were not doing well (I think they were calling out to me from the post office) and I woke up in a sweat. When I looked at the clock it was 5 am which means they had arrived. I called the hatchery Tuesday, (Estes hatchery - very nice people) and they had been shipped Monday and the post office said there trucks come in at 1am and 4 am so I knew they were there. I ran down there and rang the night bell. A very nice postal worker said "Are those your chicks?". I was so excited I could barely contain myself. They are so cute. I immediately took them home to their prewarmed Chickwagon and put their little beaks in the treated water and away they went. They are peeping happily as I write this.